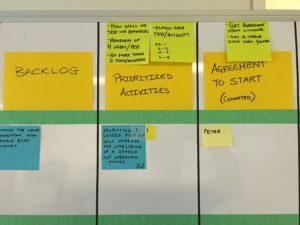 Change Management Kanban - Agile by Design Inc. 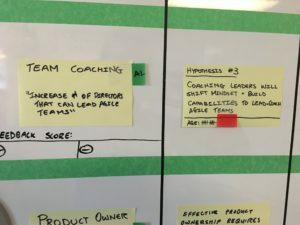 Managing large agile transformations obviously has it’s impacts on culture.  In fact, there should be no separation between “agile transformation” and “cultural transformation”. We’re currently managing a large agile transformation program. 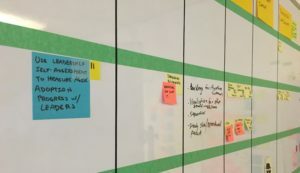 My favourite tool for managing the program is a change management Kanban board. We start with an impact map to determine the objectives of the program and prioritize the top 3-5 objectives. We limit the number of objectives the program is focusing on – 1 objective per change agent. Each objective is reviewed and a corresponding hypothesis is defined to ensure that we remain humble and honest about what we think needs to change. Each hypothesis is validated by implementing activities and experiments to test our ideas. We used 3 guiding principles to build this visualization. 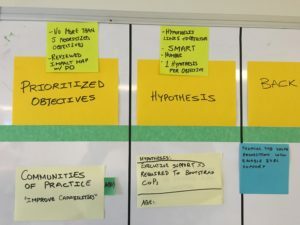 In the photo above, each objective has 1 hypothesis with a set of work policies. Each hypothesis has 1 to 2 experiments that validate the hypothesis and they are time boxed to a maximum of 4 weeks. Each experiment impacts one to many people – these are visualized above as well. 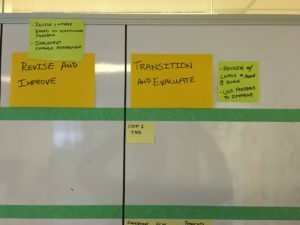 The rest of the board follows a variant of a Lean Change board as described in Jeff Anderson’s book “The Lean Change Method” (https://www.amazon.ca/Lean-Change-Method-Organizational-Transformation/dp/1492899607/ref=sr_1_cc_1?s=aps&ie=UTF8&qid=1475341157&sr=1-1-catcorr&keywords=lean+change+by+jeff+anderson). We move customers, people, groups, teams, orgs (collectively “customers”) though this section of the board. As our experiments with customers reach the end of the time box, we ensure that a feedback and review session is conducted with our customer. This is used as one of the primary inputs to how well we’re progressing towards the program objective. We added additional visualizations over time, keeping track of objective owners, feedback scores, aging and impediments.